Do you work for Wrike? "Wrike - One of the best Online Project Management Tool"
User interface is really good. You can customise the board as you want and the best part is that every user has the flexibility to customise the board as per their need. Wrike main USP is - it is FREE FOR FIRST 5 USERS. So we can use it for free, explore all its capabilities and then go for the paid upgrade. The flow can be refined more to enrich the end user experience. Apart from this, I don't think there is anything which you can dislike about Wrike. Its clean, simple, easy to use. If you are struggling to have transparency in your project and your timelines are always getting missed just because you are not able to track the progress, then Wrike is the required tool for project management which you need. Its simple, robust and IT"s FREE FOR FIRST 5 USERS! The main problem which a business suffers is transparency of tasks which are being done. With Wrike, this problem gets solved. You get to see which task the team is working and what is the status of each task. Learning about Wrike? We can help. Advanced project management & collaboration tools for Enterprise and SMB. "integrating wrike with nozbe and other programs gave me the result I was looking for and now the wor"
"The three main wrike panels help me to have a better order in the projects"
"using wrike each task and project have better focus and result"
"wrike integrated very well and now all projects have better results"
"I make my diagrams of grantt and other managements easily with wrike"
The program is good has great service but the cost is moderately high if you are willing to pay enough for a good service. Wrike is the program that I recommend because it will do your job quickly and with good results. "The software that helps you solve your projects no matter the size. " Wrike adapted very easily to our workflow is an excellent project manager for my company, streamlines the workflow as it manages and creates reports with results, we have been able to store a large amount of information in record time, it is an excellent way to group your tasks and create custom panels. It has certain peculiarities that are not useful to my company, as when it notifies you that a task is completed and is really assigned, although wrike is really good at launching updates frequently, there are specific aspects that have not been able to improve, of course this is minimum disgust. Wrike facilitates the management of multiple projects so it is advisable for your small and medium business even for people who need a tool, and you can visualize the plans perfectly, a plus is that it has a free version and free trial, works based on the cloud and in other systems. If we talk about that Wrike solved problems in our company it would be very easy to list them: it allows us to generate reports and assign tasks automatically, it is very customizable it would be a little more but I can have my own workflow, for the most part I like it a lot This product we feel comfortable. "Optimal software for the management of business projects"
The most innovative of this tool is that it efficiently allows collaboration, I like to work with Gantt diagrams and have it as a good option for managing resources and workloads, also provides information and status reports in time real.It also has an intuitive and clean user interface, which helps companies that are small or large want to join. Let's not say that I do not like it, but I think that the fact of having many functions often becomes a tool that is somewhat difficult to use. I recommend it because as project managers it is an efficient tool since it gives us the opportunity to work on one or several projects without any difficulty, as well as saving time in getting to the information you really need, providing a user interface that is quite visual and excellent integrations for optimal project management. with its implementation I have been able to turn complex projects into simple ones, I have increased productivity and defined the priorities that allow me to obtain a more optimal and fast work, I have also left aside the problem of working a single project in a certain time, but Now I can work with several simultaneously and improve the results in project planning and communication.On the other hand Wrike offers us a wide library of software and integrated applications such as salesforce, google drive, email integrations, social networks, file storage, among others that enhance the management of projects and optimize the results. "Wrike - A friendly tool for project management"
Wrike guarantees multiple functions of quality, with a high percentage of security and quality, providing an exclusive and ideal support to solve any inconvenience that may arise. It allows easy communication between colleagues, which is incredible for the correct transmission of documents, information and important data. On the other hand, their complete tools contribute to a better management of the projects, with the labeling, the notes, the categorization and the ease of personalization, everything is much simpler. Initially, for new users of Wrike it can be difficult to adapt to the appropriate usage and customization settings, which requires a lot of time, dedication and training to learn how to correctly handle all the data. On the other hand, the software has worked efficiently, with very complete tools that are executed in a professional manner, we are satisfied with the experience and we do not find any feature that we do not like. The communication between members of the team is essential, to carry out a coordinated work and achieve faster progress, with Wrike you can achieve this. The scope of the project management functions has a great coverage, allows you to organize and manage all your work with a good follow-up in the time invested. I recommend Wrike for how great he is when doing his job. Wrike has been our guidance tool and our exceptional support to follow the correct path to the completion and scope of each of our projects and objectives. Significantly, we have been able to log in and keep track of pending tasks, missing requirements, deadline events and obtain the information we have stored. Everything from a tool that has kept us organized work and projects guided by an excellent path. "A collaboration tool with very useful features"
Wrike has tools that are geared towards effective collaborations for large teams. We can keep track of virtually every detail of our projects and keep everyone aware and accountable of project activities and due dates. The account portal has a neat and clean design that makes it easy to navigate the platform. I like how various elements sync together so we can see tasks and their status in different perspectives. The overall pricing is higher compared to several of the other collaboration tools we considered. Since there are so many tools and potentially so much data to manage for certain projects, it can be complex to use this system properly for new users. Even after reading some overview articles on Wrike, I still needed to take some time to use it in order to learn how to make it work for me best. I think Wrike can be especially useful for streamlining the delivery of project information to your team. It's essentially a central nervous system that can update multiple variables in real time based on user actions. Our company uses Wrike to help create plans of action and to stay on task for completing them. It's a centralized resource that we can all connect to for project information and to ask and answer questions about issues that may arise. Wrike has been a very well-rounded platform that allows us to input and track a full range of data related to projects such as task assignments, due dates and budgets. "Tool that helps to organize all the projects of my team in one place." Collaborative work management is fantastic to extend to remote employees, which we have included in team projects that allow you to track your productivity over time. It is essential to have the technology to work more organized and faster, without difficulties that a member may be missing due to distance reasons it is time to experiment with new ways of working as a team. Wrike does what is necessary so that everyone on the team has everything at their fingertips. I like the organization and communication Wrike provides for service requests. The communication is easy through Wrike, whether it's selecting a status or sending a message. Easy to communicate with other collaborators on projects as well, everyone is always up to date on progress. It's a bit limiting from the data end - I don't see much of this, but I know my boss was trying to run reports that seemed pretty simple but couldn't get the settings right for the data she wanted. They layout and user interface is great for people who aren't totally comfortable with tech. Email communication is great also, so once a request is put in through Wrike, the user really doesn't have to login again to get updates as long as their email settings are turned on. Responding to an email from Wrike will go back to the person assigned to the task. We use Wrike for technology service requests. The benefits of Wrike really help see where the most problems are and if it's a building culture issue or an equipment issue, and where and what we need to improve. "Too much to handle. And that's a good thing." I like how dynamic this platform is. We just implemented it and are still onboarding people and my favorite thing is when someone asks if it has ____ feature, the answer is usually Yes. 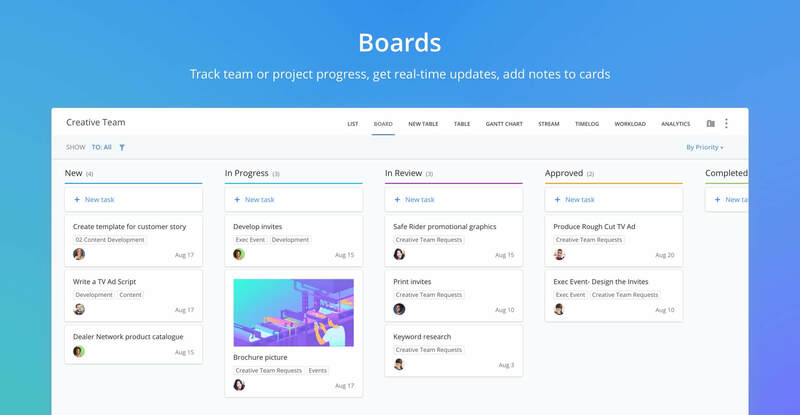 The platform works for my creative teams, my project management teams, and my more data-focused teams - each one can view their tasks and projects in their way. I almost wish they would dumb it down for us. It seems like an infinite universe of possibilities with this tool and I don't think I could ever really get a handle on all of them. We were using a combination of Smartsheet and many different spreadsheets to manage our marketing programs. Wrike is helping us to get all our marketing tasks in one place and keep them organized in a way that makes sense for our organization. I can say that it is a very good method of the communication side in which I can an easily save a history of the conversation. An easy way to solve the working process for projects in such a way as to report all working team of tasks about when to start our the project. Also, it is nicecontrol service for all of us. We don't receive any hard problems which can make bad things to our working process. Generally, the platform is used for all our team and we are glad to work with it. With this software, you will be always organized and always will be all work done on time. No doubts about it, I definitely recommend this software to everyone who likes to work with a higher level. It is always will help you with your managing projects problems. We like to work on content plan creation, very good choice of topics and tasks control related to it. Other things like business culture projects, events where we need an organized way to cooperate. Honestly, it is easy and working fast. "One of the best Project management tool out there!" I have used a few different programs to track projects and activities. I have found Wrike to be a good solution for our team. Wrike lets us set up and assign tasks very easily to complete projects. The user interface allows me to work exactly the way I want. The projects and activities are highly customization and can be viewed in multiple different views. Tagging is useful for quickly linking different projects or tasks. You can also log the hours you put into a certain activity or project. Tasks can be created under project and sub task can be created under under each task to share with appropriate team. The different view allow the user to view each project in a view that best fits the activities. I personally use the tasks to take notes on my meetings and calls. It is a good tool that does its job. The design is good overall but it is quite expensive per user as the team size increases. One of the drawbacks are that there is no shared calendar for teams to use. I wish there were more resources online to train people on how to use Wrike. Great tool but has a learning curve. Helps me keep my teams updated on the progress of projects. Gives visibility to users and helps us better manage our workload. Overall it has been a life saver. Intuitive user interface that is extremely easy to use. I have used multiple tools like Monday, Microsoft project but nothing has all the features that wrike offers. The drag and drop Folder and Project functionality allow for nesting projects inside folders and create a totally customizable flow. Wrike let's you set it up, the way you want to organize it either by project, client or team member. The tag function is something that is super useful, not to mention the various analytics, reports etc. The dashboard and report feature helps you track activities by the assignee or by the project. The stream function is super useful. The on cloud application means I don't always need to download it when I access it from computers other than my own. Too many features wish there were more resources out there for training. Also what would be helpful is a chat feature among users. Could improve the calendar and add APIs to integrate with the outlook calendar. The reporting feature is lacking, would love to have an option to auto-generate and email reports weekly. Project sharing needs to be more intuitive. Wrike helped me organize my work and be more up to date on project progress. I use Wrike daily at work and it gives me full visibility and control over my daily tasks. I love the Timeline view with all tasks spread through the time. Has given me better visibility to tasks and activities in real time. "Great tool for small teams!" Easy to use and highly customization. Allows tracking of projects by time. Plenty of integrations with other tools, my favorite being the outlook add in. Has a free plan for someone who'd prefer to try it out before they get a paid plan. Wrike offers mobile apps for Android and iOS. On both platforms, the app is optimized to work on tablets and smartphones. Wrike is unique with respect to other similar applications because it is not just a project management tool. It also functions as a work management tool, which is slightly different. You can also track individual activities not just projects. You can create sub folders for Folders. Projects can be created within folders. You can create a folder for a specific department, all projects and work for that department can be stored in subfolders and projects. Expensive and the interface could be counter intuitive at times. It is slightly on the expensive side compared to the other collaborative software. It does not have a built in chart app that is necessary for work collaboration tools. It is lacking as a work management tool. Helps my team track time spent on a project and evaluate workloads in real time. Has made collaboration easier. Great because of quick set up and excellent integration with other APIs helps in generating reports that can be used in meeting. I have used Wrike to better manage my meetings. "Wrike - What Powers the Backend to our Agency"
Wrike is a powerful organizational tool that allows us to directly proof, approve, and inform team members of changes to any particular production. Wrike has its challenges, mostly on the end-user experience as some clients have difficulty learning the platform to approve projects and requires one-on-one training most of the time. It's important to know that for large scale teams it will require a dedicated leader for training and implementation on the platform. It's only as good as you train your staff to use it properly. Our issues were solved by implementing Wrike over three years ago when we noticed a severe problem with follow-ups and information being passed to upper management. In a short period of time we were able to solve a plethora of problems from lack of follow ups to files being lost and updated. "A great tool for project management"
It is an excellent tool to monitor and control projects, daily activities and work schedule. You have options for tracking notifications of individual or group activities chronologically. The best option within the application is the report report and the gantt table. It allows reviewing the progress of group tasks and see who is advancing and who is not in each assignment. The trial period is very short to test all the benefits of the system, it is one of the best system I have used for review and monitoring of work activities. The packages offered after that period are expensive compared to other systems. It is a good option to compare with other systems, and project management resources are good. It allows to do a good teamwork management, the notification option associated to the calendar, helps to be attentive to the period of validity established by a project in general and for each specific activity, reducing execution times. Wrike is used in absolutely all of our department as the main tool for managing programs. This is completely web-based software, so you do not need to download anything. The timeline tool is perfect for setting priorities and tracking your budget and your events. You can easily organize your own plans and actions in unlimited folders. We do not get any complex problems, which can cause bad results in our workflow. As a rule, the platform is used for the purpose of our entire team, and we are happy to work with it. Wrike is able to become a great tool for solving your project problems. A free account is good, but the basic functions that I need are only available for payment. The notification function is also excellent, as it can talk about certain projects within the framework of this project or the subtitle of the project, so that anyone can see what was said about the specific task. There are excellent tools for almost all tasks and projects. "With Wrike, the workflow practically runs itself"
Wrike is a great way to centralize and organize all of the elements needed to manage our IT projects. Building custom workflows has allowed us to somewhat automate the path from start to completion, so that once a task goes in, it's tracked, acted on, reviewed and completed with minimal effort. Although this is a good problem to have, the depth of the system takes a while to get setup. Once setup however, it really takes a lot of extra work off of everyone's plate and the efficiencies gained by using Wrike far outweigh the initial effort needed to get it up to speed. Wrike constantly updates the product. New features are always being added, and they are extremely intuitive. They seem to have a finger on the pulse of their users. We are using Wrike to manage the seemingly endless list of IT related projects. Prior to using the product, we managed everything by using spreadsheets and documents stored on our file server. It proved to be a very inconsistent and unreliable method, and inevitably, tasks would get overlooked. Now that we have it all standardized and the custom workflows setup, nothing falls through the cracks.
" It is the most complete tool to monitor and control projects"
It is an excellent software to track and control. 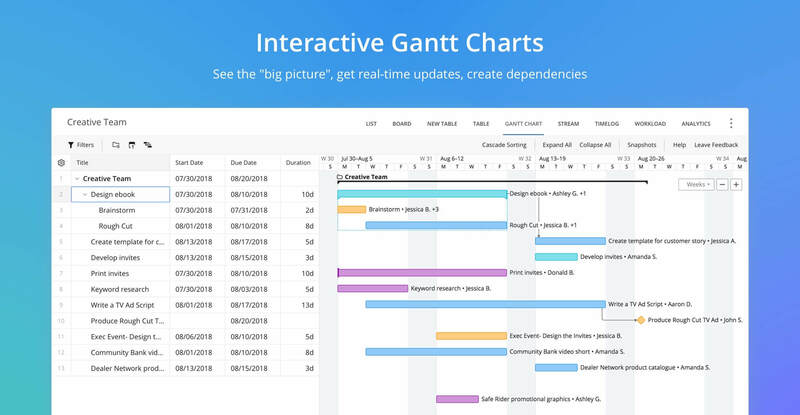 It has a quite complete control panel that allows you to review several tasks at once, what I like most about this is the use of Gantt Chart. The free trial has a short time and does not allow the option to develop the report, which would help users to give a better assessment. Include all the work team that is associated to a project, the management of several computer tools allows diversifying the way of presentation of results. Allowed the assessment of the number of people assigned in each management. Example the administrative areas use the adequate personnel, while the technical or substantive areas require more personnel for the development of projects. The substantive area for being a creative area has several active projects daily. "Wrike is a Complex, Yet Powerful Tool"
There are extensive options for managing projects and creating customized templates. You can build a template and process for just about any type of project you could imagine. Wrike is also an always-evolving product. They even allow you to be an early tester/adopter of new features through Wrike labs. It's fun to be a part of their innovations in project management and beyond. With so many options, it can make managing projects feel tedious at times. It can also work a bit slowly - sometimes reporting/analytics don't take updates into account for several minutes, and simple project updates take a while to "take." Reporting can also be a bit unintuitive, with limited options for filters and fields. Although it has shortcomings, Wrike is the most thorough Enterprise Project Management software I've used. There are endless options in the system to accommodate any project, and they are very responsive to the community. They are always working hard to make their product better, and trying new things. I manage a Software Implementation team who does Project Management for new clients. We use Wrike on a daily basis to manage all of our projects. Wrike has given us the ability to more effectively manage projects, and has given us much greater insight into metrics on our projects. "Improve your team and your work"
Managing teamwork, ideas, interactions and the way of relating is essential in a company. With this software you can easily review ideas, opinions, interests and generate a facility for fluent communication. I think that in this software could be structured even better comments, is the only mistake I see in this great program. So if they solve that little mistake and edit the comments better, it will improve a lot more. It is recommended that companies involved in improving their teamwork take into account software that helps generate stronger and more competitive teams. When you have a tool that facilitates interaction, that helps you are more willing to contribute ideas, opinions and also to feel you heard. This tool has favored that the work within our company is even better. "Perfect for Organizing/Scheduling Projects "
Wrike offers a convenient and user-friendly solution to project management, constantly adding and testing new features like Wrike Meetings (being removed in September '18). It integrates into Outlook and Chrome, making it easy and ready to add new tasks. The professional version does not allow for a single user. I'd love to have access to the more advanced features, however, the price while good for 5 users does not reflect the same for a single user. The rest of my team does not use Wrike enough to validate continuing that level of paid plan. Great for project management, especially with their increasing integrations with other software like Outlook and Chrome. It offers list views, table views, and timeline. An interactive calendar view is the only thing that is missing in my opinion. Great price for 5 person team, does not have a middle ground between free & that plan for a single user. Macro and Micromanaging my projects, breaking down all components, and keeping my multi-tasking manageable. "Very Capable Task and Project Management System"
I've used several systems designed to help you manage team and personal tasks and projects, but none have been as robust and usable as Wrike. With Wrike you can make task managing as easy or complicated as you need it to be. You can create dashboards to see specifically what you want to see and nothing else. At the same time, they provide you with great support as you get going with their product so you aren't left wondering how to use it. Honestly I haven't really found anything I dislike about Wrike yet. If you are a marketing group, Wrike is a big step in the right direction to smoothing out your processes. It integrates with Adobe, Photoshop, Illustrator, etc. and makes review processes much easier. I am part of a marketing team, and we have a ton of complicated processes that we have to go through to get our work done. Wrike is helping us to systematize those processes to make them more efficient and effective, as well as helping me to get my daily tasks organized. "helped streamline our business processes"
With Wrike, one can create a task, add it to a calendar, have a timeline and assign it to a specific person. The task can then be marked as either completed, pending, overdue etc. Wrike is a great software that makes work easier. I wish that other people in my profession can take a look at it. I am sure they will be interested in it. Wrike presents us with an easy to use software that can be used as a diary that helps us to stream line our business process managements as well as oversea projects. "Great for Project Management and Data Tracking - Very Laggy with Lots of Projects"
It's better than Trello in that it helped us scale as our professional services organization grew. Frequently we have 5-15 new projects each day, and that's a lot of data that we need to track. With Wrike's customization, we've created a flow that works for our team. It's SUPER LAGGY now that we have so many projects in the system. Sometimes I need to wait 4-5 seconds for a page to load when I click on a task. Moving from project to project or task to task is very slow because doing so often opens up the sidebar of ALL of the projects (even Completed ones!). I need to close up the tabs on all of the projects every single time, just to get Wrike to move faster. Make sure to ask a ton of questions when the Wrike Team goes to your campus and does a training. Spend a lot of time learning Wrike, because it'll hurt your team and department later when there are certain people who don't know how to use it, or who aren't comfortable making a switch to it. Wrike provides us with a ton of data. We use this data to measure the efficiency of our Research and Project Management Team. We live in Wrike every day, and we can pull daily, weekly, monthly, or customized reports which allow our managers to determine team and department workload. Wrike stood out from the rest by being a robust and flexible project management tool. We were able to customize Wrike to our workflow and to meet our needs rather than change to conform to how it worked. Customer service has been outstanding since day one. The support staff is knowledgable and quick to respond and provide assistance. There are a few functions that I think could be improved upon, most notable the proofing/approval feature and the timeline view. The proofing/approval feature is a great tool but we have experienced a few glitches and it seems a little clunky at times. The timeline view is a great view to have, but without an undo feature you have to be really careful when looking at rescheduling different tasks. If you are looking for a one stop shop Wrike is the answer. Its robust nature and flexibility allow for different workflows and processes. Keep all you work and processes in one place with Wrike. Project management, task management, collaboration and transparency. 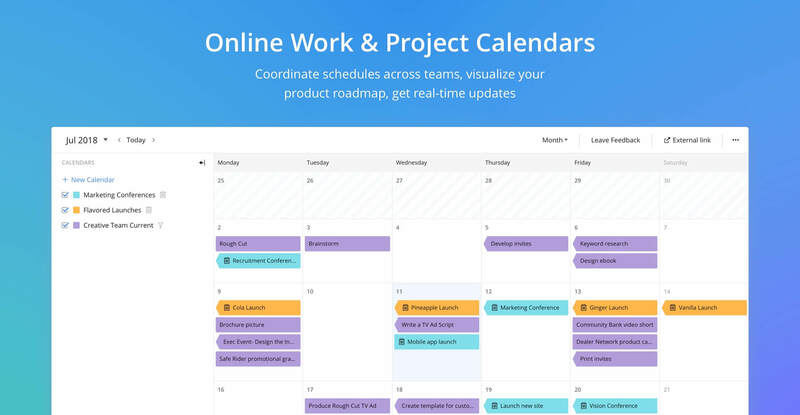 With Wrike we are able to keep better track of where we are with our projects and our workload, thus helping us meet deadlines and keep everyone informed. "Better than other systems, recent updates have been great"
Wrike has a very clean, user-friendly interface. You don't have to hunting for your work or get hung up on technical glitches or errors - you see what you need to see, when you want to see it. I like the different pipeline stages you can use as a multi-person project progresses. I also really like the new calendar feature that they rolled out, after a long time requesting a calendar view. Look at it closely compared to other systems like Asana and Trello before making a decision. We have a lot of back-and-forth between teams, and Wrike makes that easier to deal with. As a result, there's less frustration on an individual level and higher productivity across the department. I also personally really like the calendar view - it makes it easy to see what coming weeks look like, and if I need to work hard to get ahead and not get swamped. "Great Task Management and Time Management tool"
I like the amount of visibility and collaboration within Wrike. We can quickly see what projects each artist has on their plate and adjust as needed, communicate on those projects and report on the work we do. It's been a game-changer in how we communicate our work throughout the organization. With any software there are enhancements that could happen. There's still work to be done in reports to make them more useful and easier to organize. I've offered that feedback and there has been forward progress so I look for it to continue to improve. Definitely consider it. It's been a great tool and was very fast and easy to start working in. We had our space set up and were inputting tasks within a day. It's very fluid and easy to make changes on the fly if something needs to change in the space. Prior to implementing Wrike, we didn't have great (any) visibility to what everyone was working on and where that project was in the workflow which made it very difficult to determine capacity. We also had no way of accurately reporting on the tasks that we were working on. The tool that we had been using had undergone some functionality changes that even made it so we couldn't see when a task was complete. 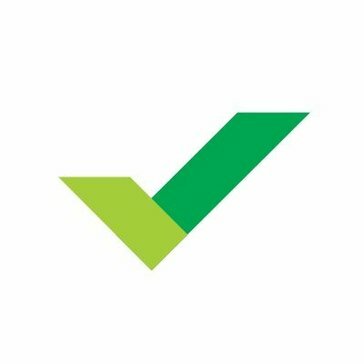 Wrike seemed to fit nicely, it was easy to implement and has checked all the boxes for what we need to see, do and report on. "The Best Project Management Tool on the Market"
I have tried a lot of project management tools--none stack up to Wrike. This tool is the perfect combination of structure and flexibility. The folder/project tree is an easy way to organize our work. Our Wrike folders mimic our shared drive folders. I love that everyone on our team can organize their work exactly the way they like. The dynamic views (list, board, table, timeline, stream, etc.) in conjunction with detailed filters is extremely powerful. We are able to slice and dice projects and tasks any way we'd like. Choosing a project management tool is a big decision. There are so many options out there. It can become overwhelming. I have attempted this feat multiple times and every time, I come back to Wrike. Before Wrike, our team was really disconnected. Our Marketing team has grown so much and with so many team members and projects, email was becoming too much to handle. Our email inboxes are much cleaner! We're all on the same page and able to maintain a high-level view of everything going on in the department! Wrike is an online tool that allows you to plan your projects so you can access it on sevral platforms as soon as you have an Internet connection. You can create projects, folders and tasks. You can easily share them with members of your team. Several editions are available but under 6 personnes, you have a free edition. A French interface is available and can be useful for some users. Wrike can be used by either small or larges teams/companies. Also wrikes provide interesting newletter and in France they have organized a tour to get Tips & Trips and to exchange with other users. Each task have its own URL addres which is quite usefull if you want to automate tasks or if you want to create workflows. Advanced functionnalities requires the Entreprise edition which is the most expensive one. When implementing it is important to pay attention to how you organize your project and must pay attention to the change management. Take time to implement Wrike and help your users specially at the begining if you want them to properly use it. WIth wrike we now have a single tool to plan tasks. We have a planning to share with other taem members and with others teams wich can only have viewing rights. You can add comments and files to tasks. You can esaily notify team members .Also use the cronometer for each task and easily buils reports. "The most Flexible Project Management tool"
Wrike understands that project management is about process. Identify the process gaps within your organization or team can have huge impact on productivity and time management. We were able to build process between teams and leverage the system to deliver projects on time. There isn't much that I disliked because Wrike is built to fit your needs. The only complaint that I had was the file management aspect and they did a good job of reacting to their customers needs and updated the technology to accommodate those needs. We were able to build process between teams and leverage the system to deliver projects on time. It solved the issue of productivity and accountability by providing visibility that the team did not have before. "Tried multiple platforms and nothing beats Wrike"
It is easy to get onboard, intuitive, offers a lot of functionalities for the price. Time tracking is a key feature that other project management software don't offer out of the box. For me its important as I want to keep track of the time we spend on projects so I can demonstrate how many resources needed. I looked at other platforms, and nothing provided me the benefits and features for the price we pay. The pricing plans could be more flexible. The number of user jump is quite big for our size of our team. It goes from 5 to 15. If I just need 1 more, I need to justify the jump in cost. Once you go up in plans, they apparently don't let you go back down, but they did for us. I guess I was very persuasive. You need to give it a trial. I recommend you understand what your objectives are before you trial any software. I am certain Wrike will meet all of them. We've been using it for more than 3 years. We've evaluated other platforms and really nothing suited our needs like Wrike does. It is truly wonderful, user friendly. You've got to do a trial run of it before you make up your mind. Project management, task management, collaboration and transparency on workload. It also provides me the ability to add an unlimited number of contributors which is great. Other colleagues have really appreciated the collaborative aspect of Wrike. 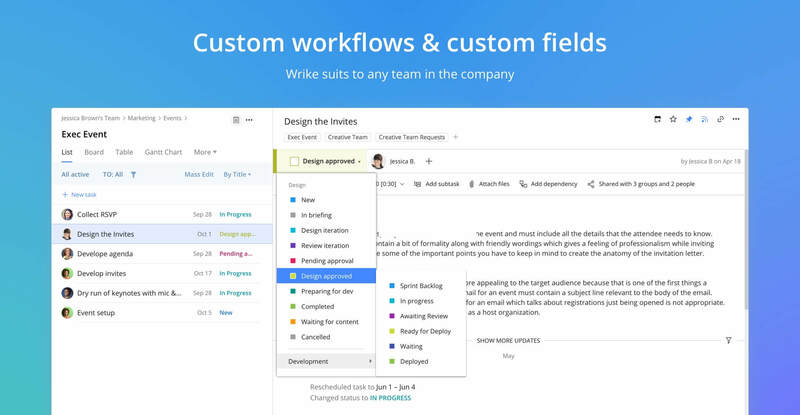 "Maximize Organization and Project Flow Ease"
Having worked with multiple project management software over the last couple of years, I can honestly say that Wrike seems to be one of the best on the market. Its customizable project flows (that allow for multiple projects with different workflows) and its personalized dashboards (that give a user the opportunity to organize their own tasks in a manner that suits them best) make Wrike an excellent tool for everyday project management use. Wrike has a fairly shallow learning curve, which is a bonus compared to other similar software, and its ease of use (including the ability to @mention team members) allows for easy and effective communication with maximum efficiency. If you're working on various clients, personalizing a dashboard by client name can sometimes take some elbow grease and a little Wrike expertise and know-how to accomplish. In addition, sometimes Wrike has a tendency to glitch, which makes both its effectiveness and ease of use suffer dramatically. When this happens, updates are unable to be published and team members are unable to view task details. I would highly recommend all users create a custom dashboard, on which they can personalize project they are working on. This can be done by client name, type, due date, active vs. on hold - all these features allow me to keep the multitude of client projects that I work on during my day organized and clear. All the projects our company completes are currently managed through Wrike, showing the importance of this software to our daily business. Wrike allows us to work with people throughout the company, and even externally (clients) and serves as a place for project meetings, updates and direction. It also serves as a record for project progression and brainstorming of ideas. "Discover your creativity with Wrike !" I used a few software like Wrike to manage personal tasks and projects with my team in the company but They were not robust and helpful as much as Wrike did. With Wrike you can make fast reports your organization without any delay. This product is best way for us to control and monitor each other to make each other more effective and creative. I really enjoy to work with Wrike and it is best in this area I can say. We are as team really happy to have software like Wrike. It is quite fir for my organization and this is making us more motivated in anytime. I do not have any complain or problem with Wrike I can say but I can give some advice about mobile version of it. I can not say that mobile version is working well as website version I think it should be improved as soon as possible because we need sometimes mobile version and it is working really slow. I can recommend for any company. with wrike you will discover how creative person you are. you can think and create new ideas and then you can make them real with Wrike. I am using Wrike with my team in organization and we can be fast organize with each other and communicate in any time for anything. we create new projects and new opinion. Thanks to Wrike we increased our organization productivity and profitability. "Here is great software for projects !" It is really easy to use for anyone.With Wrike it is also really easy to save the history of the chat and I really love this side of Wrike. Thanks to Wrike I can solve my working process for projects and I can report all things to my team mates without delays. it is really nice organization and control service for me and my team. Honestly I can not say anything bad for Wrike. This is really fit application for me and my organization. The platform is used by all our team and we are really happy that we have something like Wrike. I can recommend for any companies, with Wrike you will see how creative you are. you will get taste the working as team and sharing ideas with each other to implement your goals. Wrike is being used by me and our team in the company generally in marketing area. thanks to Wrike we are really doing well our works and all managers are thankful to organization. we are so creative and creating interesting projects for company and our customers.making cooperation, editing easier. "A work hub that keeps everyone connected and up to speed"
The different sections in Wrike are well-spaced and have a clean design that makes everything easy to find. The visual organizational features like the calendars and Gantt charts are interactive and sync immediately with data and can be adjusted with intuitive mouse click, drop or drag controls. I like being able to tag people to make assignments and messaging more clear. Wrike is also compatible with many business platforms, which makes is great for boosting its capabilities even more.